Hiding wires from the sun; self-healing gel for circuits; defect-free monolayer MoS2. There’s a problem with most solar cells: the electricity-carrying metal wire grid on top prevents sunlight from reaching the semiconductor below. A team from Stanford University tackled this problem, discovering a way to hide the reflective upper contact and funnel light directly to the semiconductor below. For the study, the researchers placed a 16-nanometer-thick film of gold on a flat sheet of silicon. The gold film was riddled with an array of nanosized square holes, but to the eye, the surface looked like a shiny, gold mirror. The perforated gold film covered 65% of the silicon surface and reflected, on average, 50% of the incoming light. Until they immersed the film in a solution of hydrofluoric acid and hydrogen peroxide, which caused the gold film to sink into the substrate and created silicon nanopillars in the holes of the film. Within seconds, the silicon pillars grew to a height of 330 nanometers, transforming the shiny gold surface to a dark red, a signal that the metal was no longer reflecting light. The research team plans to test the design on a working solar cell and assess its performance in real-world conditions. Researchers from The University of Texas at Austin developed a self-healing gel that repairs and connects electronic circuits. 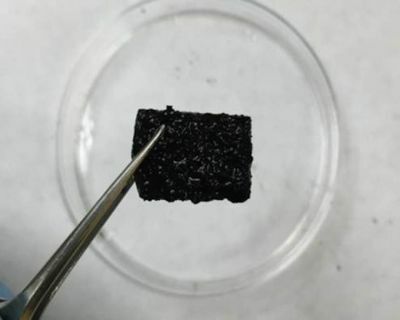 The material has high conductivity and strong mechanical and electrical self-healing properties, which could be of use in the development of flexible electronics, biosensors and batteries. The team created the self-healing gel by combining two gels: a self-assembling metal-ligand gel that provides self-healing properties and a polymer hydrogel that is a conductor. Yu believes the self-healing gel would not replace the typical metal conductors that transport electricity, but could be used as a soft joint, joining other parts of the circuit. The team is also looking into other applications, including medical applications and energy storage, where it holds potential to be used within batteries to better store electrical charge. Monolayer semiconductors hold promise in the development of transparent LED displays, ultra-high efficiency solar cells, photo detectors and nanoscale transistors. Unfortunately, the films are notoriously riddled with defects, killing their performance. 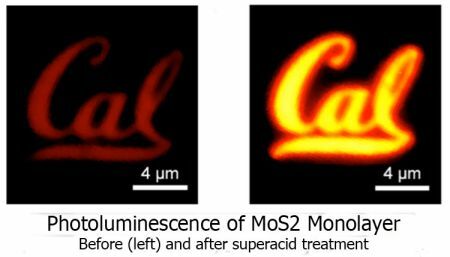 A research team, led by engineers at UC Berkeley and Lawrence Berkeley National Laboratory, found a way to fix these defects in monolayer molybdenum disulfide by dipping a sample in an organic superacid called bistriflimide. The chemical treatment led to a dramatic 100-fold increase in the material’s photoluminescence quantum yield, a ratio describing the amount of light generated by the material versus the amount of energy put in. The greater the emission of light, the higher the quantum yield and the better the material quality. The researchers added that the efficiency of an LED is directly related to the photoluminescence quantum yield so, in principle, one could develop high-performance LED displays that are transparent when powered off and flexible using the “perfect” optoelectronic monolayers produced in this study.